To ensure the success of every project, stakeholder identification and involvement is essential. 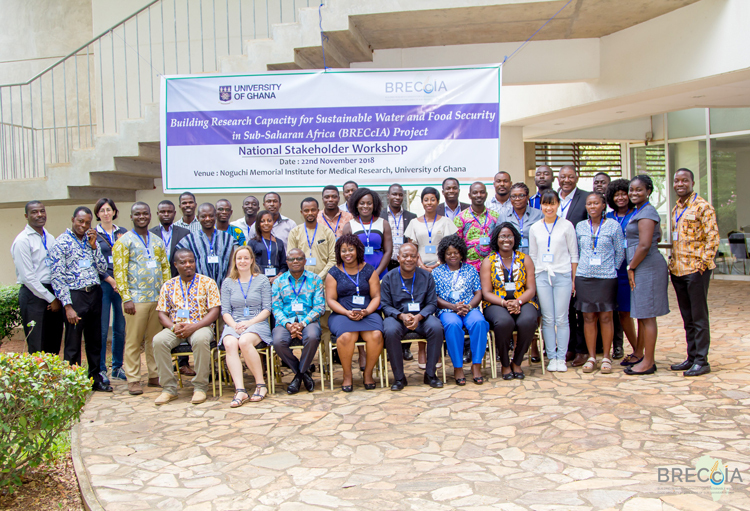 It is against this background that the BRECcIA Project has successfully engaged national level stakeholders in Ghana towards building research capacity for sustainable water and food security in drylands in the country. The workshop brought together thirty-three stakeholders representing the media, government Ministries and agencies, NGOs, and academia. Aside the hosts from University of Ghana (UG) affiliated to the Regional Institute for Population Studies (RIPS) and the School of Public Health (SPH), the BRECcIA team also had representatives from the University of Southampton, MMUST (Kenya) and LEAD (Malawi). This team was very instrumental in having participants engage very actively during the workshop. Participants were encouraged and guided to discuss issues pertaining to the specific workshop sessions. In his welcome remarks, Prof. Joseph Yaro, the Director for RIPS commended the project’s initiative as an important addition to efforts towards incorporating research into policy. This was followed by an introduction to the BRECcIA Project by Dr Mawuli Dzodzomenyo, a Co-I to the project in Ghana. He then opened up discussions with stakeholders on co-designing and co-production of the research. In the session that followed, led by Moses Asamoah and Genevieve Agaba, stakeholders were randomly grouped and asked to identify hotspots for food and water insecurity with the aid of maps and the criteria for selecting those areas. The identified hotspots varied by groups and the common criteria included rainfall, groundwater availability, soil quality and infrastructure. In this same session and in their groups, participants were tasked to identify the challenges associated with availability, access to, utilisation and stability of water and food security. The third participatory session was on Existing Policy Frameworks related to drylands, food and water security, led by Yaw Atiglo.In particular, the participants in their groups identified related programmes or policies and how these could help address food and water security issues; the difficulties with implementation and how implementation could be improved. The policies that stakeholders discussed included the National Seed Policy (2013), National Nutrition Policy (2013), Food and Agriculture Sector Development Policy I & II (2002 & 2007), National Water Policy (2012), National Irrigation Policy (2011) and Riparian Buffer Zone Policy (2011). The discussion on research gaps led by Prof. Codjoe saw these stakeholders identify some strategies that could assist researchers in bridging the gap between academic research and policies, analysing policy-oriented research questions and identify those that best fit Ghana in addressing water and food security challenges in drylands. Among the many challenges identified, the inability of researchers to translate their findings into policies was paramount. In their evaluation of the workshop, most participants indicated their pleasure with the calibre of stakeholders engaged as well as the participatory approach employed in the workshop.